If Yes, then you are even more important than your CEO!!! 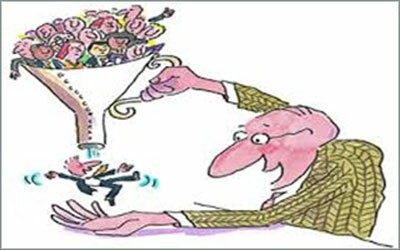 Because, an organization is only as strong as its people & thus your company’s future depends on your hiring decisions. Temporary and transient though your role may be, YOU are the single most important employee in your company. The opening needs to be filled as quickly as possible. To keep up.. you need a strong foundation with the judgment to think critically, cut through the red tape and decision-making obstacles, find the top talent and HIRE before your competitors do. You could be a CEO, Project Manager, Division head or a Technical lead. Once there is an opening in your team, you have to find a team member who is going to directly report to you. The new hire would certainly impact your team’s output and culture and that’s why you want to hire nothing but the BEST! “Hiring Right is a Necessity” Today it is a necessity to find & retain high-quality, high-potential employees in a diminishing pool of talent. Finding the right match requires time and attention, and it’s something even busy managers need to make time for. “Hiring is not the only job that you do” Hiring is not the only task that you perform, you are not Hiring expert still you are expected to Hire the Best. “You get the Blame” From discussions to blogs a lot has been talked about the problem with the Hiring Managers, their relationship with recruiters, the communication gap and lack of participation. “You bear the Brunt” Since you are most commonly hiring your own direct reports, there’s a lingering perception that you’ll be the one who will bear the brunt of the consequences of a bad hire. With this mindset, hiring managers are not allocated the training, support, and time that you need to do a good job. This guide is to empower you Hiring Managers with the mental building blocks to stay ahead in an aggressive industry. WHO WE WROTE THIS GUIDE FOR? We wrote this guide for an audience who may be new Hiring Managers, experienced Hiring Managers or recruiting managers. Basically, anyone who is hiring and wants to learn how to recruit and retain the best talent in minimum time and costs. STEP ZERO - WARM UP TO YOUR NEW ROLE!!! Being a Great hiring manager can be challenging when you are dealing with many diverse roles. Warm up to this crucial task with understanding your role and impact and also assure yourself - Why spending your time wisely in the hiring process, will ultimately funnel back to ROI for your team/company. 1. Champion - Whether you have identified a new position, or there is a need to fill an open position in your team, as an initiator of the position, you are the champion of the whole process - from start till the end. As the head of the employee selection team, you are responsible for getting all of the right people in the recruiting team and manage the performance and responsibilities of everyone in the selection team. 2. 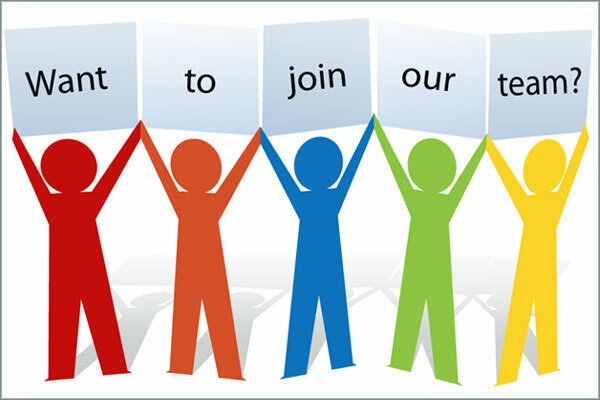 Liaison & Communicator – You are the one who is going to communicate with Human Resources to fill the open position through every step of the organization's Hiring Process. You will also set up the timely communication between you, the selection team, recruiters and or HR partners. 3. Marketer - Hiring managers are in a unique position to make their departments, teams, and job opportunities look great. You're responsible for transmitting information about your organization and its goals to the new member onboarding your team. 4. 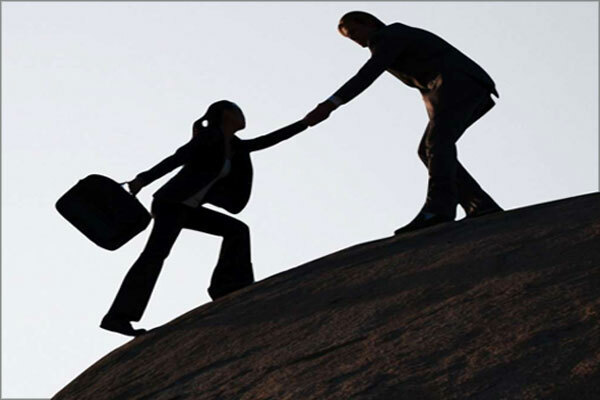 Leader - You make the final decisions for new talent to your group or company. As a leader, you are responsible for setting up a healthy team culture with a right mix of compatible people and a fostering environment. Because as a hiring manager, you actually know the real need and that’s why you need to strike the right balance for both your own team and the company as a whole. Today, it is a necessity for every company to look for high-potential, high-quality employees in a diminishing pool of talent and at the same time, the cost of a bad hire runs high. Hence, companies must avoid bad hiring decisions. Therefore, the role of Hiring Managers becomes vital. Sure, HR has an important hand in the pot, but ultimately it’s the hiring manager who does the bulk of the legwork. This is why it’s very crucial to prepare for the pivotal task you are about to take on. 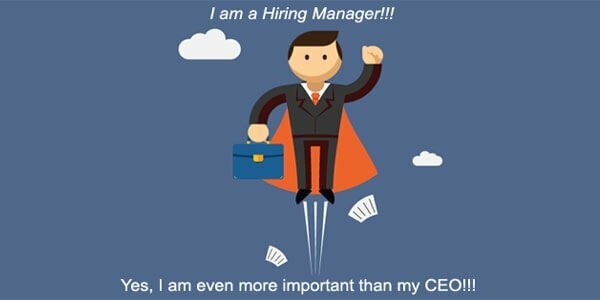 What is the Impact of a Great Hiring Manager? The success of your organization is predicated on your ability to hire great new people, and to get them onboard and working effectively quickly. Your decisions determine the pace at which your company can move. If you take too long looking for the perfect fit, it’s going to slow you down. 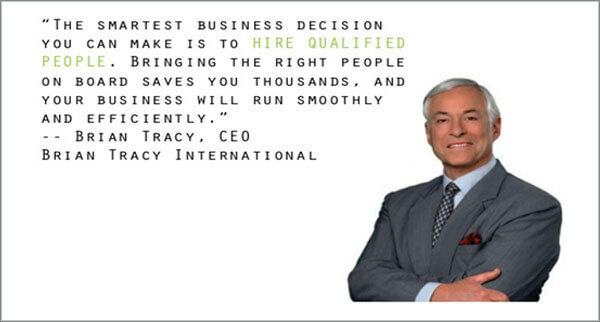 But if you hire too quickly and brazenly, you can end up filling your ranks with ineffective workers. Conclusion: In your Hiring Manager's role, it is necessary to learn the art of effective hiring and transforming this art into a repeatable science. 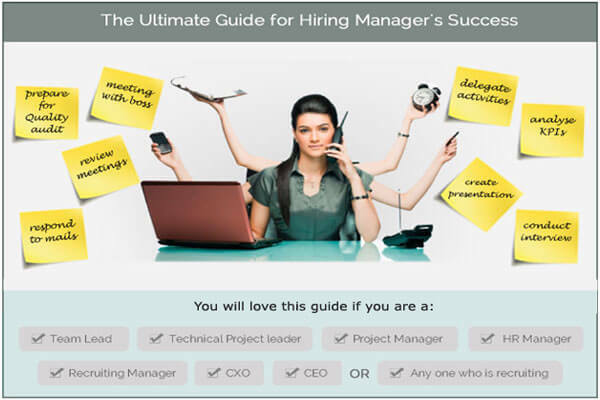 This quick guide will help you avoid any pitfalls and walk you through best practices that can make you a great Hiring Manager and thus contributing to your success, your team’s success, your company’s success. 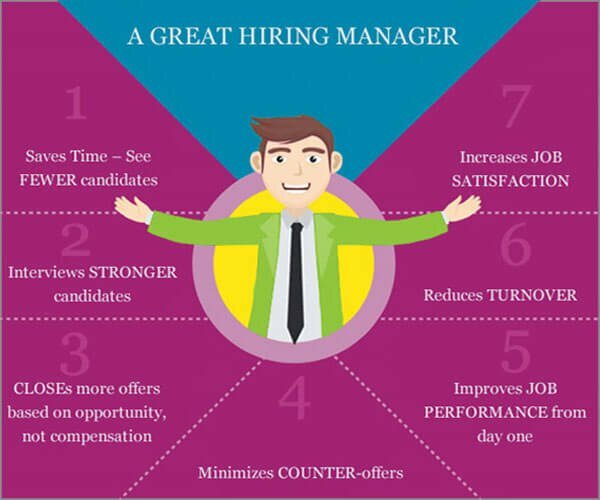 By following some simple steps explained here in an easy to read manner, you will become that SuperMan Great Hiring Manager. STEP ONE - DEFINING THE JOB PROFILE!!! A problem well-defined is half solved. Knowing the mother problem is the key. Hence, as a hiring manager if you are able to define the requirement correctly it would become a lot easier for you and for the hiring team to source & hire the right candidates. This Step will walk you through how to define the performance based job profile. Your obvious question would be - I have so much to do already, why put so much of my time here? My answer is: because only well-defined problems lead to breakthrough solutions. The picture below depicts the problems that arise when you don’t define the job profile well. Most recruiters complain that Hiring Managers resist spending time here in the first step. It is because they are result oriented and wish to save time wherever they can and a copy-paste Job description looks like a time-saving option. But.. believe me, it's NOT! Beware! If you leave it to a fast job description which is a cut & paste job most of the times, handover the requirements to the recruiter, you cannot expect a great deal of desired talents in return. So it’s wise to spend some time in defining the Job Profile well. Once you are able to define/visualize your ideal candidate in the job and are able to explain it well to the recruiter, the problem is well defined and half solved. According to a study, in most hiring programs the critical missing piece that can bring the recruiter, the hiring manager and everyone in the hiring team on the same page is a well-defined performance based job profile. How to define a Job Profile? 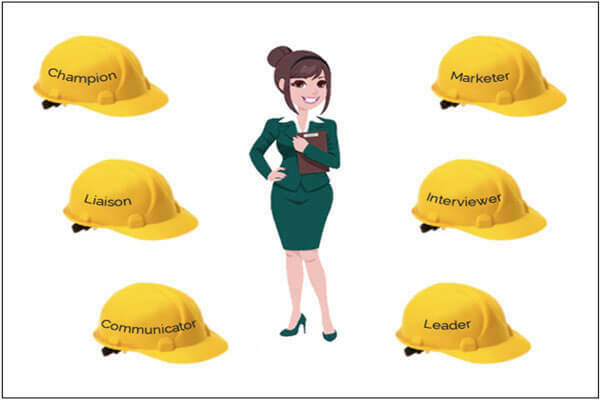 To define a job profile try to dig deep into understanding real job needs. Apart from listing the usual Skills and Objectives of the Job role, try to define the job in terms of key performance goals of the position. What are the major purpose and objectives of the new hire? What will the person hired have accomplished in 1 year time that indicates to you without a doubt that the person is in the top 25% of his or her peer group? What will the person need to accomplish in the first 30-120 days after starting to indicate to you that the person is on track to accomplish the major objective defined in Step 1? What is the primary subtask the person needs to be able to do to ensure all of the other subtasks are achieved? What are the minimum knowledge, skills and abilities required for the job and how will the person use this skill or ability on the job? What do the best people do differently, and how do you track performance at each step? What are the biggest challenges the person is expected to handle in the job? What are the personal characteristics that contribute to a person’s ability to perform the job? By answering these eight questions, you will get a clear picture of the purpose, goals, key performance indicators, skills, expectations and challenges of the particular Job Profile. Conclusion: A Well Defined Performance Based Job Profile can be used to attract the best applicants and later this Job profile can be used to assess their motivation to excel, based on evidence. Now that you have composed the Job Profile after giving specific answers to the above questions. You get armed to write an effective job title and a detailed Job Description that will attract the right pool of applicants for the position. If you want the recruiter to source & deliver you the right sort of talent, you need to make an upfront investment to ensure that the recruiter understands the requirement completely. 1. Job Description: A well-crafted Job Profile will arm Hiring Manager to explain the requirements well and expect desired results. 2. LinkedIn Profiles: You can sit with the recruiter and perform live searches on LinkedIn. 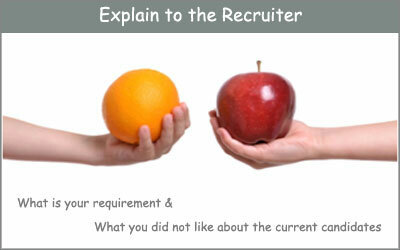 It will give the recruiter a much better understanding for what you are looking for and what you are trying to avoid. 3. Advanced People search on LinkedIn: LinkedIn Advanced Search will help you and the recruiter quickly assess the size of the talent pool for each set of criteria. 4. Sample Companies & Employees: Give recruiters names of companies where you are likely to find suitable candidates for that role as well as names of current employees who would fit the bill. This will help the recruiters visualize your ideal candidate. 5. Selling points of the position: To help your recruiter be in a better position to source candidates effectively, provide him the selling points of the position. 6. Experience & Skills: Though in some cases experience and skills might be necessary to perform a task, but a Hiring Manager should not always insist on certain years of experience and certain set of skills. 7. Other Factors: You may discuss other factors that may affect sourcing options like the current labor market, any anticipated obstacles and career paths so as to determine the optimal profile and options. With some carefully planned, interactive sessions with the recruiter, you can explain what type of candidates should be sourced in the first place. Conclusion: This type of quality meetings ensures the communication, saves time and sets the stage for the recruiter to source high-quality talent. The more effective briefing, the better the recruiter would be able to deliver the right talent to the hiring manager. Once you are done with defining and explaining the Job role, the next big step is to set the course of action for everyone who is involved in this hiring process. Time for the recruitment planning meeting. The Recruitment Planning Meeting is the opportunity to not only gather key details for the position and build out a recruitment strategy but also to set the stage for the entire recruiting experience. 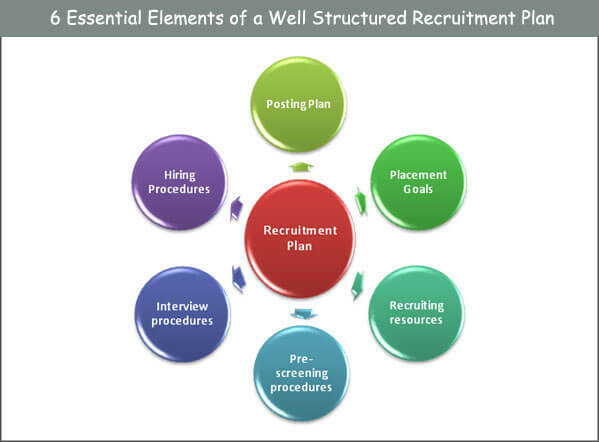 This picture depicts the elements of recruitment plan. 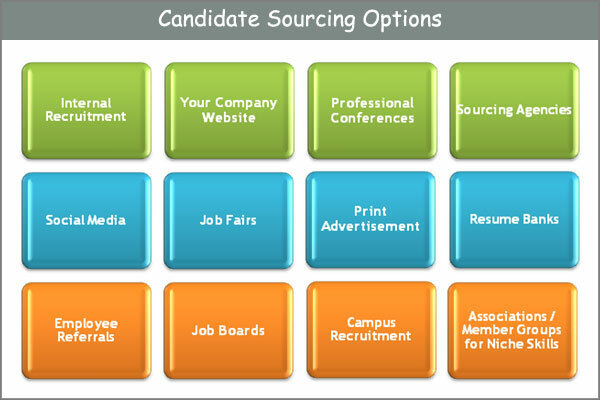 There are various candidate sourcing options that recruiters can use, here the key is to aggressively seek and go after ideal candidates. 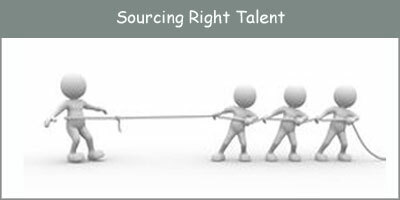 Note: Apart from the above talent sourcing options Your organization may have some well laid specific processes which you may need to adhere to. Most Important Tip - Keep an eye on the progress of sourcing! Analyze the first few candidates’ information given by the recruiter; if they don’t match with what you expected then meet your recruiter. Explain to him again about what you are looking for in the candidates and what you did not like about the current candidates. It’s always better to stop a mistake at its beginning. 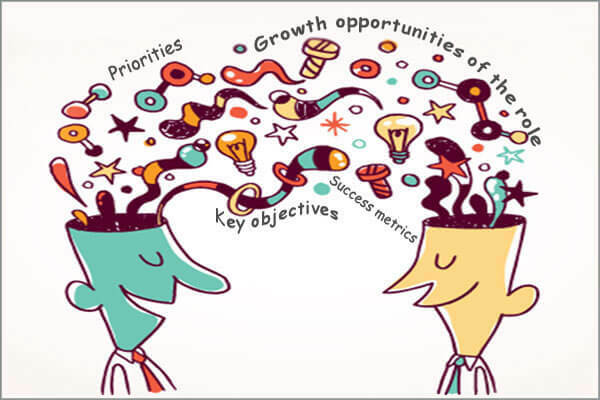 To ensure right output, communication needs to be ongoing and in-depth. At a minimum, a weekly update meeting should take place. Bring Innovation: Ask your recruiter about innovative ways to source candidates. Keep a Watch: Keep an eye on the progress of sourcing. Pre-Hire Screening: Choose effective pre-employment skills test to filter candidates for the right skills. Set Interview Plan: Plan the Interview process well to determine the best suitable candidate. You are responsible for getting all of the right people looking at a candidate. To inject the right balance and insight into the hiring process, you need to bring a right mix of right people in the hiring team. 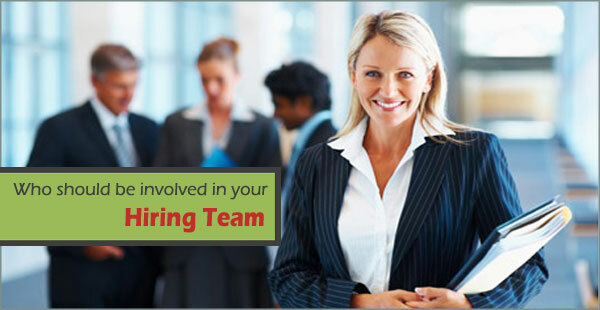 Commonly a hiring team is made up of the Hiring Manager, HR Manager, Departmental supervisor, Team Members and others who have a stake in the functions that are performed by this particular job. 1. Skills: At least one Job function specialist or a technical skill expert, basically one or more people who can assess the required skills in the candidate. 2. Diversity: You need to have a right mix of people and experience to avoid bias or imbalance in decisions. 3. Team Members: It helps to involve some members of the team the candidate is joining in the selection process of any new talent. 4. Customer: In some cases it is wise to include an individual who can interact closely with the position and/or serves as the main customer. 5. 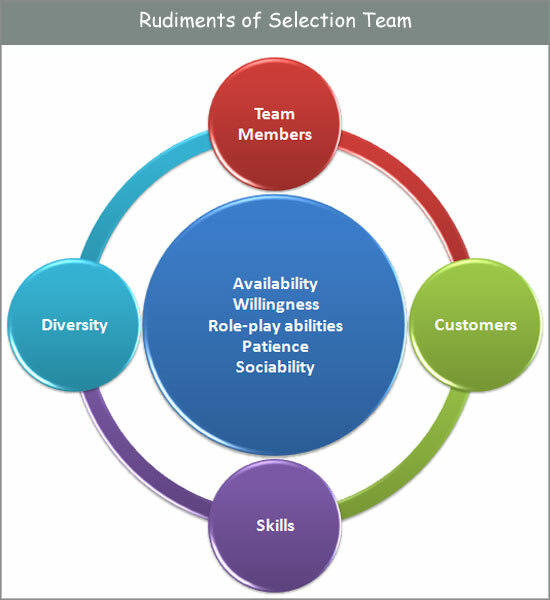 Other Factors: Some other factors that you may also need to consider are availability, willingness, role-playing abilities, patience & sociability of the members that you wish to bring in the Hiring Team. Conclusion: TEAM is Together Everyone Achieves More!! 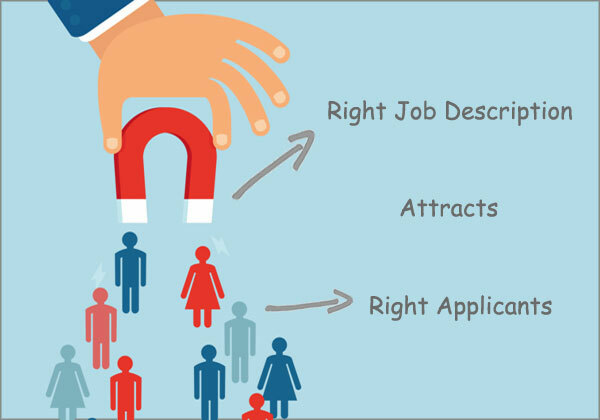 A right Hiring Team is crucial to reap benefits of your hiring efforts. There should be a right mix of skills and diversity to ensure an unbiased decision and a good candidate experience. Now you need to get every member of the interviewing team up-to-speed on how to interview and recruit top talent. Approach: How you approach each candidate? Expectations: What are you looking for in this hire? Interview Process: How will the interview work? Assessment Plan: What’s the plan for assessing the candidate? Negotiations: What’s the salary negotiation strategy? In this meeting, you need to set up a general structure for the interview. Make sure that all interviewers are all in agreement as to what the hiring profile is, and that they send a consistent message to the candidate on the position, company and culture. Conclusion: Proper orientation of the hiring team will improve your hiring effectiveness tremendously, it will not only ensure the validity of your assessments, but also the ability to reliably compare one candidate to another. Though sourcing right pool of talent is the primary task of the recruiter, if Hiring Managers play a part of catalyst in it, the quality of sourcing increases a lot. Your little contribution here will lead to your hiring team talking to the right type of candidates. To be a great hiring manager who consistently hires the right candidates at the right time, you need to play multiple roles: a Catalyst, a Consultant, and a Marketer. A few quick initiatives from you will help a great deal to source great talent to your team. Please see below some quick tips to outreach right sort of talent you want. 1. Update your Social Profile: Start with your LinkedIn profile and make sure it’s complete. LinkedIn is generally the first place where someone you have just contacted will begin researching you. Similarly, update your other social profiles like Twitter, Google+. 2. Social Updates: Through status updates, sharing articles or posting presentations, you can showcase candidates the kind of work opportunity you present, your team’s passion and goals, and most importantly your team’s achievements. 3. Recommendations: Ask people you have managed to describe, in a recommendation, what it’s like working for you. Candidates will get a personal sense for work environment you foster and development opportunities in your team. 4. Personal Touch: You can also opt to engage your target with an InMail. Professionals want to see that their potential managers care about them. Conclusion: Hiring managers are a key driver of the talent experience. If you engage a little more in the process, it will create a significant impact on quality of hire and retention. While the above suggestions are quick to implement and won't demand much of your efforts and time, they may yield surprising results. Pre-employment skill testing is a commonly used candidate assessment tool for screening applicants at the first level of candidate interaction. Skill tests are designed to confirm that applicants have the skills they say they have. These tests can range from simple employment typing tests to a complex software coding test. Now as you are clear with the Job Profile, you have identified the primary skills required and the experience range of the candidate. You can choose a ready/custom made skill test suiting your needs. 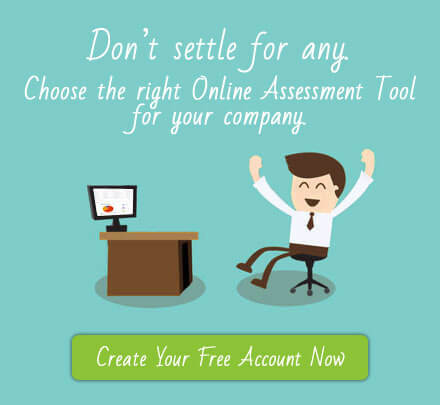 Now the question that remains is how to choose the right online assessment software for your role? The Answer is: Your Online assessment software should be to provide you a secure platform with quality skill tests. Difficulty Level: Appropriate difficulty level as per the experience mentioned in the job description. Right Mix: Carefully decide the right mix of theory, practical and hands-on questions to be asked in the screening. Comprehensiveness: A Quality skill test should be comprehensive to cover the skills required to do the job. Aptitude: Don’t forget to check the aptitude required for that job profile. E.g. mechanical aptitude (with questions on pulleys, struss etc) for the job that requires mechanical knowledge. Valid & Reliable: The tests should be proven, validated and reliable in similar scenarios in the past. What to avoid: Avoid test questions of an overly personal nature or that are considered offensive. As per an article by Lisa Quast in Forbes - By consistently applying tests to all candidates, skill tests can actually help reduce legal risks. Personality testing: Personality assessments to use in a hiring context should be valid predictors of job performance and measure stable traits.While choosing any personality assessment, you need to step back and ask yourself one basic question before giving it to a potential employee: Is this test predictive of future job performance? In an article from Harvard Business Review, Whitney Martin discusses well the pros and cons of using personality tests for hiring. Drug testing: Many companies require potential job candidates to have a drug screen before extending an offer of employment. According to the U.S. Department of Labor, workers who abuse drugs are more likely to use their health benefits and submit claims for workers' compensation. In addition to medical expenses, drug abuse is associated with increased tardiness, absences and poor performance in the workplace. Even though screening tests are occasionally challenged in court, companies can reduce their legal risk by ensuring test validity and reliability, by making sure tests do not cause a disparate impact on minorities or protected groups, and by consistently applying tests to all candidates. Conclusion: Delegate the screening process. You don't want to spend your Hiring team's quality time in interviewing the wrong candidates. Hence, you must screen candidates with the use of effective screening softwares and save billable hours. The interview team should be prepared on who will ask what questions. Hiring managers who can interview effectively are a rare breed. 1. Spend time only with relevant candidates: Avoid wasting your team’s time with wrong candidates, use tools for screening and skill testing. Always remember, an interview is a group activity, all the interviewing team has to give time for this activity. Therefore, it is important to respect everyone’s time and save billable hours by spending time only with relevant candidates. 2. Candidate’s Willingness to Learn: Find out whether the candidate is willing to learn new skills, overcome problems, make difficult decisions, increase confidence and achieve challenging results. 3. Sell the Position during Interview: The hiring manager should talk best about the role, the team, key projects, etc. Selling a candidate does not only consist of pitching the role during the first call or interview, it’s an ongoing effort that continues until the employee is in the role (and beyond of course). 4. Indulge in Casual Talk: Intelligent Hiring Managers talk to their candidates. You can send strong positive signals to your candidates with a casual talk, and also find out if there will be any difficulties closing the candidate later and address them early. For example by asking even simple questions like “Hi, how are things going?” “Do you have any questions for me?” or “What surprised you during these last conversations?” With this type of casual talk, you can take the candidate’s temperature, identify objections and handle them quickly. However while engaging in a casual chat with the candidate, remember to avoid any question that can land you in legal issues. You can refer to this round up of 51 questions to avoid asking during an interview. Conclusion: Your judgment of candidate as right-fit & competent with respect to the job is very crucial as it will decide the fate of the candidate as well as the fate of your company. Try to implement these 9 Interviewing tips in your next interview and you should be able to corroborate first impressions and hire the top performers. Cultural fit has nothing to do with appearance, affability, assertiveness, and how articulate the person is. At best these traits represent social skills and extroversion, but certainly not ability, team skills, performance, or cultural fit. 1. The CEO and the company’s strategy, vision, and mission: A company’s underlying culture is largely defined by its CEO. 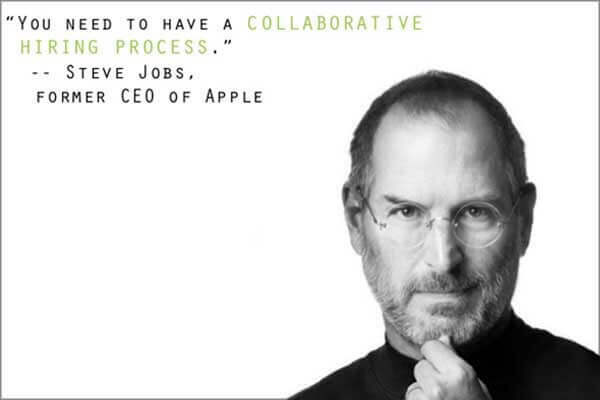 Consider Steve Jobs as an example in comparison to every other high-tech, big or small company CEO. 2. Job fit: It is necessary to know if the person is motivated to do the actual work required. Cultural fit is a meaningless assessment when the work isn’t motivating. If the candidate is not a job fit, he would be harder to manage and work with, less flexible, less cooperative, and overall less productive. 3. Managerial fit: The relationship with the hiring manager is a prime determinant of cultural fit. As for most of the employees, the direct supervisor represents the actual culture. Most people agree that even good people underperform due to a difficult working relationship with their manager. 4. Organizational pace and structural fit: Fast-growing companies are coupled with a highly charged and competitive environment whereas mature organizations represent a slower paced, process oriented environment. 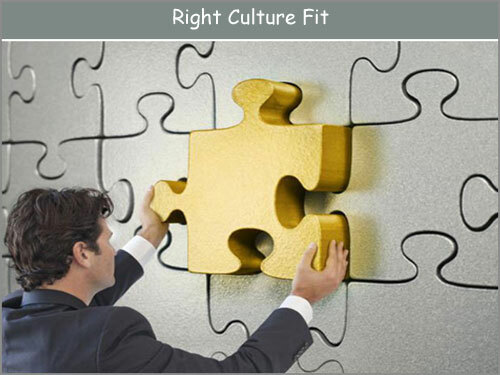 Therefore, while determining a culture-fit, you should also keep organizational pace into account. 5. Decision-making: Whether formal or ad hoc, a company’s decision-making process is a core component of its culture that needs to be considered when assessing candidates on cultural fit. According to a study from Radford University cited by Kerry Schofield on ERE.net, employees that fit in well with their organizations reported higher job satisfaction, identified more with their company, were likely to remain in the organization, were more committed, and even demonstrated better job performance. Conclusion: It is important to hire for cultural fit in addition to a skills match. By carefully analyzing the 5 factors mentioned above you can gauge if the candidate will fit in with your company. Here is a list of interview questions to determine culture fit that you can ask to find out the right match for your company. This is an Art too! Now that you’ve landed your star candidates, it’s time to get them up to speed and down to work. It’s time to onboard them. * Socializes new hires to the company culture. * Improves new hires experience. Good onboarding rapidly engages and connects the new hires to the life of the organization. That engagement leads to employee commitment. And their commitment leads to accomplishment. On-boarding remains a key factor in inspiring employees, supporting them climb the corporate ladder and lastly, retaining them. Don’t believe this? 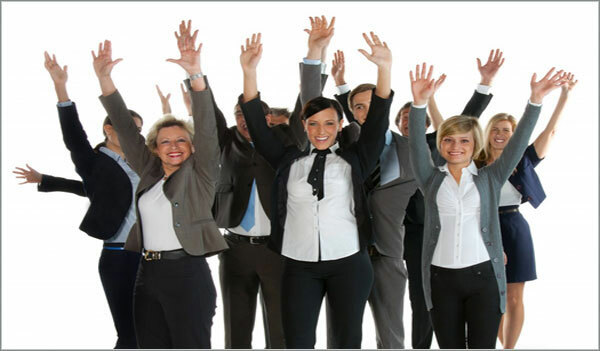 A study by Deloitte showed that 22 percent of staff turnover occurs in the first 45 days of employment. Moreover, 4 percent of employees would make a hasty exit on the basis of the first day, given it turns into an awful experience. 1. Customize: Customize the onboarding according to the nature of the newly hired employees role and tasks. 2. Make it smooth: The essential company paperwork and tasks are unavoidable but with good processes in place you can save time and avoid any mess. 3. Automate: Automate some processes, so that there’s no compelling reason to take exhausting and time wasting halts for individual tutoring. 4. Simplify: A tedious onboarding procedure can cut the connection through which an employee see him as potential supporters of the organization’s mission and vision. Hence, a general guideline of discussion with new hired should take place in a shorter, sweeter and much simpler manner. The traditional one-week onboarding program is not enough, onboarding should be seen as extend as an outgoing activity to lead business growth. According to a research from Aberdeen Group (Onboarding: A New Look at New Hires) - “Traditional new hire programs last for one week or, in some cases, a single day. These short-term strategies fail to improve areas such as retention, productivity, and engagement. Conclusion: A successful onboarding is not a one-and-done thing. Check in regularly to ensure the onboarding experience is consistent with the employee experience. Use surveys, informal one-on-ones, team building exercises and follow-on conversations with assigned mentors to ensure your new hire is still on a good path. At last, there is one more interesting initiative that you can take up. Being a great hiring manager doesn’t only mean making great hires. It also means identifying talent that’s already onboard, and developing those stars to be the great hiring managers of the future, this would be like a future investment that will certainly give you a high ROI. This point bears repeating: The hiring manager is in the best position to help develop other hiring managers. Don’t take the easy way out and simply rely on HR to fill this role. Start by finding employees who have the soft skills that are required for the role. 2. Approachable: The personality of the new hiring manager should be approachable and non-threatening. 4. Intelligence: Should possess the intelligence to know when they’re wrong. Get your budding managers involved in several different hires, and see how it goes! Conclusion: In the end, having the right people in the right places at the right time will enable you, your team and your company to take advantage of market opportunities, meet business goals, and spur innovation. Clearly see the type of person who will be successful in the position. The recruiters would be able to attract the right talent for you. You will know exactly what skills needs to be tested. 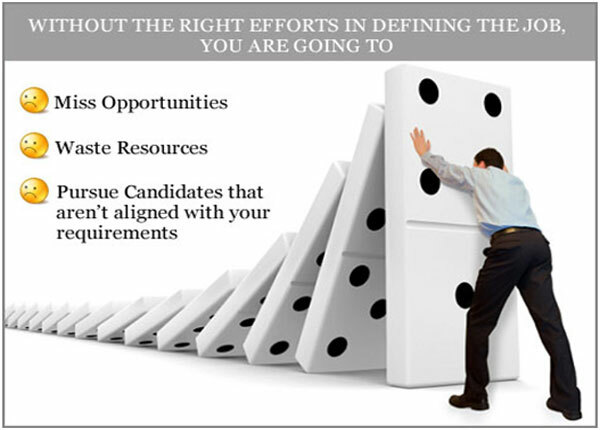 You will waste less time with the wrong candidates. Your hiring team will have a roadmap of questions to ask during interviews. You will make this art of hiring right as a repeatable science which you can further nurture in the new hiring managers. All of this results in better employee hiring, which leads to improved company performance. Well worth the investment indeed!